Characterizing the breeding site of Anopheles sinensis is of major importance for the transition from malaria control to elimination in China. However, little information is available especially regarding the characteristics and influencing factors of breeding sites of An. sinensis in Yongcheng City, a representative region of unstable malaria transmission in the Huang-Huai River region of central China. The aims of this study were to determine the breeding site characteristics of An. sinensis and related environmental and physicochemical parameters, to find out which breeding site characteristics could best explain the presence of An. sinensis larvae, and to determine whether the breeding habit of An. sinensis has changed or not. Random repeated cross sectional study was undertaken in six villages of the Yongcheng city characterized by different levels of the historical incidence of P. vivax malaria. The potential breeding sites of An. sinensis larvae in each village were examined twice per month both in the household courtyards and the village surroundings. The larval sampling was done by the standard dipping method. Some important breeding site characterizations were recorded and characterized. The anopheline mosquito larvae and emerged adults were identified to the species level morphologically and to sub-species by the ribosomal DNA PCR technique. Chi-square analysis and logistic regression analysis were applied to determine the importance of factors for explaining the presence or absence of An. sinensis larvae. According to the ribosomal DNA PCR assay, all sampled anopheline mosquito larvae and emerged adults belonged to An. sinensis. Only 3 containers that were sampled from the household courtyards were found to contain An. sinensis larvae. There were no differences in the species composition of mosquito larvae among containers that contained water in the household courtyards (P > 0.05). An. sinensis larvae were shown to be present in a total of 60 breeding sites in the village surroundings, this included 8 (13.3%) river fringes, 26 (43.3%) ponds, 23 (38.3%) puddles, and 3 (5.0%) irrigation/drainage ditches. Logistic regression analysis revealed that the breeding site type, water depth, chemical oxygen demand (COD), ammonia nitrogen, and sulphate were found to be the key factors determining the presence of An. sinensis larvae. Approximately 94.9% of An. sinensis larvae inhabited relatively large and medium-sized water bodies, with depths between 0.5 m and 1.0 m (73.3%), COD lower than 2 mg/L (75%), ammonia nitrogen lower than 0.4 mg/L (86.7%), and sulphate lower than 150 mg/L (58.3%), respectively. These results indicate that the majority of An. sinensis larval breeding sites were relatively large and medium-sized water bodies with depths between 0.5 m and 1.0 m, and containing low levels of COD, ammonia nitrogen, and sulphate, respectively. For effective An. sinensis larval control, the type of breeding site, water depth, COD, ammonia nitrogen, and sulphate should be given higher priority over other factors in areas where it is the primary vector. Malaria is a major health and economic threat to about 40% of the world's population [1–3]. Plasmodium falciparum malaria is responsible for the majority of the disease burden [4–6], while Plasmodium vivax malaria is the geographically most widely distributed [7, 8]. The current estimate of human lives at risk from P. vivax malaria is 2.6 billion [9, 10], and South and East Asia account for 52% of the total P. vivax malaria burden . Re-emergence of malaria often becomes a serious public health threat in many countries . In China, malaria has been prevalent throughout the country for many years , and still represents a major public health problem [14, 15]. Cases of malaria have dramatically increased in the areas along the Huang-Huai River region of central China after 2001, especially in Henan Province and Anhui Province [14, 16–18]. In response to the global initiative to eradicate malaria [19–24], a national plan for malaria elimination was proposed by the Chinese Ministry of Health in 2009, and a nationwide campaign was launched by the Chinese Government in 2010, to eliminate malaria in most endemic regions by 2015 and to achieve ultimate national elimination by 2020. In China, Anopheles sinensis, Anopheles lesteri, Anopheles minimus and Anopheles dirus are considered to be the principal vectors of malaria [25–27]. However, malaria outbreaks and re-emergences were only in the areas where An. sinensis is the principal vector in recent years [14, 28, 29]. Each anopheline mosquito species has its preferred breeding site for oviposition, depending on weather conditions, physical geography and human activity. Breeding sites could be natural or man-made, shaded or sunny, permanent or temporary, of various sizes and located in running or stagnant water bodies, among others [30, 31]. Previous studies have demonstrated that An. sinensis larvae were commonly found in shallow and fresh water breeding sites with emergent vegetation, and exposure to sunlight . The main breeding sites include rice fields, open grass ponds, irrigation canals, ditches, ground pools, swamps, marshes, streams, shores of lakes, stream margins, and seepages, among others. Environmental factors in the breeding sites are closely related to the breeding habit of the mosquito larvae. The changes of physical factors (temperature, light, water, and wave), chemical factors (chloride content and organic pollution), and biological factors (aquatic vegetation, food, and natural enemy), may cause the changes in breeding habit of mosquito larvae. However, from the existing literature little is known about the change of breeding habit of An. sinensis in the regions of unstable malaria transmission in China. In recent years, some factors, such as the local ecological alterations due to the increasing water pollution , the adjustment of regional agricultural structures , the increased use of chemical pesticides [35, 36], and the changing global climate [37–44], can significantly affect the population dynamics and the breeding habits of An. sinensis, indirectly affect the transmission of P. vivax malaria [14, 45, 46], and pose a significant challenge to the implementation and achievement of malaria elimination in China. Informed larval interventions that target more prolific breeding sites have enormous potential in combating P. vivax malaria, especially at a regional scale. Therefore, characterizing An. sinensis breeding sites and related environmental and physicochemical factors could be very useful in understanding the variations observed in malaria transmission intensity, so that more effective vector control strategies could be planned. However, little information is available regarding the precise breeding sites and the changes of breeding habit of An. sinensis in Yongcheng City, the most highly endemic area in the Huang-Huai River region of central China in recent years. Therefore, the main objectives of the present study were to determine the breeding site characteristics and related environmental and physicochemical factors of An. sinensis, in order to find out which breeding site characteristics could best explain the presence of An. sinensis larvae, and to determine whether the breeding habit of An. sinensis has changed or not. The results can provide baseline data essential for planning and implementing of An. sinensis larval abatement programs in China. The study was undertaken in six villages of the Yongcheng city characterized by different levels of the historical incidence of P. vivax malaria. These included two high risk villages, namely Dingtang village and Zenglou village (Lizhai township, annual average incidence rate > 100/100,000), two intermediate risk villages, namely Renhu village and Mengzhuang village (Houling township, annual average incidence rate 10 ~ 100/100,000), and two low risk villages, namely Wangshanzhuang village and Magutong village (Chenji township, annual average incidence rate < 10/100,000) , (Figure 1). Among them, P. vivax malaria was endemic and transmitted by An. sinensis . Map showing the survey villages in Yongcheng city of Henan Province, People's Republic of China. Yellow dot represents the study village; Dingtang village and Zenglou village in Lizhai township belongs to high levels of historical incidence of P. vivax malaria; Renhu village and Mengzhuang village in Houling township belongs to intermediate level of historical incidence of P. vivax malaria; Wangshanzhuang village and Magutong village in Chenji township belongs to low levels of historical incidence of P. vivax malaria. These villages are located in an area with the latitudes between 33°42' and 34°18', and longitudes between 115°58' and 116°39' . Most of the regions are flat at about 33 meters high altitude. The climate is warm temperate from May to October, and the annual average temperature is 14.3°C. The range of annual rainfall is between 556.2 mm and 1,648.9 mm, and the dense rainfall is concentrated in June to September. The Tuohe River is the main environmental feature in the area. These rivers break into small ponds and puddles during the hot and dry season, and ponds and puddles, which are formed by the river become adequate breeding sites of An. sinensis. The inhabitants of these villages live in brick houses. In these villages, the primary farm crops include wheat, soybean, corn and a small amount of cotton and potato. During summer, most of local residents tend to sleep outdoors . 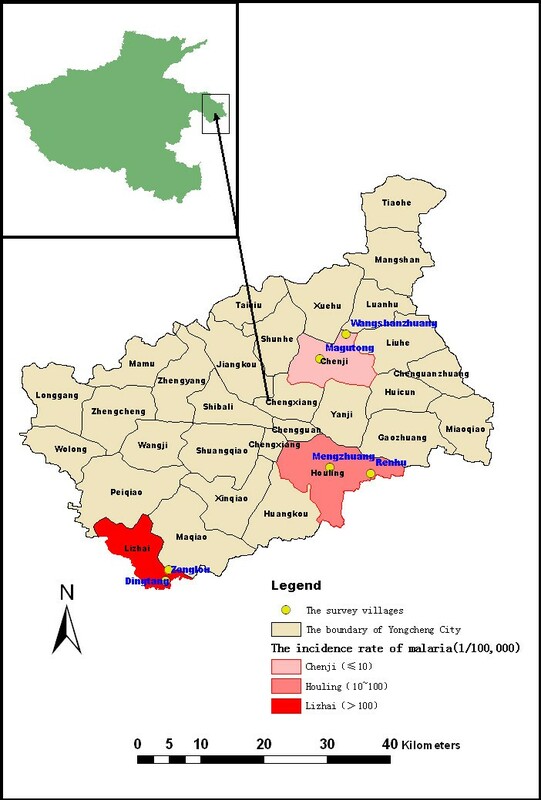 Besides the difference in the level of the historical incidence of P. vivax malaria, other characteristic differences between the six studied villages are as follows: First, Dingtang village and Zenglou village are adjacent to Guoyang County; Renhu village and Mengzhuang village are neighbouring to Suixi County. Guoyang County and Suixi County are unstable regions of P. vivax malaria in Anhui Province. In contrast, Wangshanzhuang village and Magutong village are not adjacent to Anhui Province. Second, the water-body distributions and appropriate breeding sites of An. sinensis larvae in Dingtang village, Zenglou village, Renhu village, and Mengzhuang village are more than those in Wangshanzhuang village and Magutong village. Third, the population of animal hosts in Renhu village, Mengzhuang village, Zenglou village, and Dingtang village was larger than that of Wangshanzhuang village and Magutong village . Random repeated cross-sectional study was carried out from July 1st to November 30th, 2010. The breeding sites in each village were examined twice per month for the presence of aquatic stages of anopheline and culicine mosquito species. Each village was systematically searched for the potential breeding sites both in the household courtyard and in the village surroundings. The larval sampling was done by the standard dipping method as described by Service . In the household courtyard of each village, 10 household courtyards were randomly sampled. The primary container types in the household courtyard are of great epidemiologic significance, if a high density of An. sinensis larvae inhabited these types of containers. Therefore, all the containers in the sampled household courtyard were inspected for the presence of mosquito larvae and pupae during the study period. In the village surroundings, all the potential breeding sites within 1 km were located and inspected. When mosquito larvae were present, 10 dips were taken with a dipper in each breeding site. When a breeding site was too small to make 10 dips, water was dipped as many times as possible . In extensive water bodies, dipping was carried out at 100 m apart. The pupae were also collected and transferred into a bottle beaker containing 250 ml water obtained from the breeding site. The pupae were then taken into the laboratory in Yongcheng CDC, and allowed to emerge. In the field of each village, anopheline mosquito larvae were separated from culicine larvae and Aedes larvae. The anopheline mosquito larvae were classified as early instar stages (I and II) and late instar stages (III and IV) according to the keys of Gillies and Coetzee . A portion of the late instars of anopheline mosquito larvae were immediately preserved in 90% absolute ethanol and then taken to the laboratory of the Chinese Center for Disease Control and Prevention (China CDC) for species identification under a compound microscope using commonly accepted guidelines [51, 52]. The sampled anopheline mosquito larvae were preserved individually in Eppendorf tubes containing absolute ethanol, pending further identification by polymerase chain reaction (PCR). A Qia Amp DNA Mini Kit (Qiagen Inc., CA) was used and DNA was extracted from these late instar larvae and thorax of emerged An. sinensis according to the manufacturer's instructions. The PCR conditions used in the present study were the same as a study of Ma Yajun, et al. in China . The late stage instars of anopheline mosquito larvae and emerged adults were identified to the species level morphologically, using taxonomic keys and to sub-species by the rDNA PCR technique [53–55], because individual species within the Hyrcanus Complex could not be identified by morphology alone. Some important breeding site characterizations, namely container type, water depth, substrate type, canopy, and surface debris were recorded for all the containers in the household courtyard. In the village surroundings, the larval breeding sites were characterized either visually or using hand-held equipment . The primary container types were classified as follows: plastic bucket (a plastic container and used for containing water), cement crock (a cement container with a larger opening and used for containing water and grain), stone groove (a stone rectangular container used for feeding pigs, chickens, goats, sheep, among others), washbasin (plastic or metal container used for washing face), tile jar (a small ceramics jar used as a container for containing water and grain), bowl, tray, and gallipot (a small earthenware pot used by pharmacists as a container for ointments). The identified bodies of water were classified according to their nature: river fringes (breeding sites formed along river banks when the water level drops), ponds (water area larger than 50 m2), puddles (water area less than 50 m2), irrigation/drainage ditches, and ground pools . The perimeter of each breeding site was categorized by the estimation as shorter than 10 m, 10 ~ 100 m, and longer than 100 m . Substrate types were classified into muddy, sandy (gravel with soil), and cinder. Distance to the nearest house was measured by GPS. Water depth was classified into shorter than 0.5 m, 0.5 ~ 1.0 m, and longer than 1.0 m. Canopy was measured visually by estimating the area of larval breeding site covered by shade, terrestrial vegetation, and other objects . Surface debris was also estimated visually by researchers. In each village, the stability of mosquito larval breeding sites was classified as either temporary or permanent. Temporary breeding sites held water for a short period of time (until approximately two weeks after the rainy season ended) and stemmed mainly from rain showers. When rain ceased these breeding sites dried out. The permanent breeding sites, on the other hand, held water for a longer period of time (approximately two to three months after the rain ended or fed by natural underground sources) and hence were more stable . The permanent breeding sites remained in the same location throughout the sampling period while temporary breeding sites changed depending on the availability of water. In the present study, permanent breeding sites found during the study period included river fringes, ponds and puddles. Temporary breeding sites included roadside ditches, rain pools, shallow drainages, and ground pools. In each locality, water samples were collected for physico-chemical analysis. Water samples were transferred to the laboratory in tightly closed glass bottles and kept at 2 -8°C in a refrigerator. They were analyzed within a maximum of 1 day post-collection . Physico-chemical analysis of water from the Anopheles mosquito breeding site was done in the laboratory of the Yongcheng CDC. Physical factors include turbidity and chromaticity. Turbidity was measured by transmissometer and was classified into two levels as less than 0.3 and larger than 0.3. Chemical factors include pH, chemical oxygen demand (COD), ammonia nitrogen, sulphate, and chloride. The pH value was measured by an electronic device (HANNA©HI 98128 Combo PH&EC, Hanna Instruments. US DESIGN PATENT D462, 024). The contents of COD, ammonia nitrogen, sulphate, and chloride in the water obtained from An. sinensis breeding sites were measured in the laboratory of Yongcheng CDC, using standard methods . Biological factors studied in the present study include predator, algae cover, emergent and floating plants, among others. Predators include larvivorous fishes, dragonfly larvae, water scorpions, water bugs, among others. The algae cover was estimated as the percentage of the total breeding site . Emergent plants included both aquatic and immersed terrestrial vegetation. All visual classifications were performed by one person throughout the sampling period to avoid discrepancies. Ethical approval for this study was obtained from the Ethical Committee of China CDC and permission was also obtained from the Municipal Government, the Municipal Health Bureau in Yongcheng city and Yongcheng CDC. The composition of mosquito larvae among containers that contained water in the household courtyard was calculated. A Chi-square analysis was applied to determine the importance of factors for explaining the presence or absence of An. sinensis larvae. Some factors which are of statistical significance using Chi-square analysis, were selected and further analyzed by Binary logistic regression analysis to calculate the odds ratio (OR) and 95% Wald Confidence Intervals. However, this study focuses on the presence of An. sinensis larvae rather than their abundance in the aquatic environment, because quantification of larval abundance is prone to sampling errors, particularly in the large aquatic environment . All measured parameters were included in the Binary logistic regression model. Presence of larvae was categorized as one, while the absence of larvae was categorized as zero in the logistic regression model. The water temperature, although important for the development of the mosquitoes, is only useful when the temperature range during the day is measured. However, water temperature in the present study was not discontinuously measured, thus was not included in Chi-square analysis and Binary logistic regression analysis. Statistical analysis was carried out using SPSS software (Version 11.5 for windows, SPSS Inc., Chicago, USA). A total of 100 Anopheles larvae and 100 adults emerged from pupae collected in six villages, were further identified to sub-species level by the rDNA PCR assay. Based on rDNA PCR analysis, all sampled Anopheles larvae and adults belonged to the same species, namely An. sinensis. It was probably that there were no other species of the Anopheles mosquito of Hyrcanus Complex, except for An. Sinensis, that existed in Yongcheng City [61, 62]. As far as the percent composition of primary container types in the household courtyards in Yongcheng city is concerned, the present study demonstrated that a plastic bucket was the most common container (41.27%), followed by cement crock (22.89%), washbasin (13.86%), and stone groove (8.13%), respectively. A small proportion of container types, such as tile jar (2.41%), bowl (1.51%), tray (1.20%), and gallipot (2.41%), also existed. A total of 430 containers in six villages were examined, and 98 (22.8%) containers were dry at the time of visit. Among the 332 (77.2%) containers, which contained water, An. sinensis larvae were present in only 3 (0.90%) of these containers (Table 1). There was no difference in the composition of mosquito larvae among containers that contained water in the household courtyards (χ2 = 46.390, df = 48, P = 0.539). As seen from Table 1, no mosquito larvae inhabited 145 (43.7%) containers which contained water, 95(28.6%)of which were productive for culicine larvae, 48 (14.5%) were productive for Aedes larvae, 7 (2.1%) were productive for Armigeres subalbatus larvae, and 1 (0.3%) was productive for An. sinensis larvae (a plastic bucket). An. sinensis larvae established a symbiotic relationship with culicine larvae in 2 containers (a stone groove and a cement crock) (0.6%). The findings mentioned above demonstrated that a low level of symbiotic relationship between An. sinensis larvae and culicine larvae was observed in these containers. 1 Others refer to mortar, bottle, and septic tank. A total of 156 potential mosquito breeding sites in the village surroundings of six villages were examined, 22.4% (35) were dry at the time of visit. Among the 121 sites which contained water, 49.6% (60) were productive for An. sinensis larvae. An. sinensis larvae were discovered in 60 breeding sites, this included 8 (13.3%) river fringes, 26 (43.3%) ponds, 23 (38.3%) puddles, and 3 (5.0%) irrigation/drainage ditches. Further biological and physicochemical factors of these breeding sites were measured, as shown in Table 2. 1 Each potential mosquito breeding sites are classified based on the main characteristics (the types of breeding site, perimeter, distance to the nearest house, substrate types, canopy, debris, the stability of mosquito larval breeding sites, turbidity, flow or static, water depth, predator, algae, pH, COD, ammonia nitrogen, sulphate, chloride, chromaticity, emergent plant, floating plant and so on). 2 N refers to the number of each characteristic. Chi-square analysis was used to determine the importance of factors for explaining the presence of An. sinensis larvae. There were marked differences in the composition of An. sinensis larvae among the types of breeding site (χ2 = 18.214, df = 4, P = 0.001), the stability of mosquito larval breeding sites (χ2 = 5.356, df = 1, P = 0.021), water depth (χ2 = 11.412, df = 2, P = 0.003), chromaticity (χ2 = 9.690, df = 3, P = 0.021), predator (χ2 = 8.091, df = 1, P = 0.004), pH (χ2 = 11.477, df = 3, P = 0.009), COD (χ2 = 34.377, df = 3, P < 0.001), ammonia nitrogen (χ2 = 57.233, df = 3, P < 0.001), sulphate (χ2 = 13.344, df = 3, P = 0.004), and chloride (χ2 = 12.461, df = 3, P = 0.006). The primary breeding sites of An. sinensis larvae included ponds (43.3%), puddles (38.3%), and river fringes (13.3%). In these breeding sites, most of An. sinensis larvae preferred to breed in permanent water bodies (95.0%), with depth (0.5 m ~ 1.0 m) (73.3%), pH (8.0 ~ 10.0) (85%), COD (< 2 mg/L) (75%), ammonia nitrogen (< 0.4 mg/L)(86.7%), sulphate (< 150 mg/L)(58.3%), chloride (15 ~ 30 mg/L)(53.3%), chromaticity (< 45) (88.3%), and no predators (68.3%). All factors which were of statistical significance using Chi-square analysis were selected and further analyzed by Binary logistic regression analysis. The main parameters entered into the model included the types of breeding site, the stability of mosquito larval breeding site, water depth, predators, pH, COD, ammonia nitrogen, sulphate, chloride, and chromaticity (Table 3). Table 4 demonstrates the key factors that determined the presence of An. sinensis larvae in water bodies in the village surroundings by Binary logistic regression analysis. The types of breeding site (OR 0.178; P = 0.006), water depth (OR 0.262; P = 0.037), COD (OR 0.308; P = 0.010), ammonia nitrogen (OR 0.357; P = 0.002), and sulphate (OR 0.413; P = 0.007) were found to be the key factors which determined the presence of An. sinensis larvae. For effective An. sinensis larvae control in future, these factors should be highly emphasized. The precise identification of the anopheline mosquitoes in Yongcheng city is of great significance to the malaria elimination in China. The rDNA PCR assay revealed that An. sinensis was the sole potential anopheles species of Hyrcanus Complex and the finding was identical to the results from previous reports in China [14, 47, 63]. The river fringes, ponds, puddles, irrigation and drainage ditches in the village surroundings were found to be the main breeding sites of An. sinensis, while only 3 containers in the household courtyards, including a plastic bucket only with An. sinensis larvae and two other containers (a stone groove and a cement crock). Even though the positive containers were relatively less in sampled containers, these types of containers mentioned above were very popular in the household courtyard of local villages, and thus have epidemiological significance in vector control for malaria elimination in China. Chi-square analysis demonstrated that factors related to the presence of An. sinensis larvae included breeding site type , the stability of mosquito larval breeding sites, water depth, predator, pH, COD, ammonia nitrogen, sulphate, chloride and chromaticity respectively. Binary logistic regression analysis revealed that breeding site type, water depth, COD, ammonia nitrogen and sulphate were the key factors that determined the presence of An. sinensis larvae. Previous studies found that the breeding site of An. sinensis was much the same everywhere [32, 64]. It breeds in a wide range of breeding sites which consist of, naturally-made clean water, stagnant or flowing; primary breeding sites include rice fields, ditches, streams, irrigation canals, marshes, ponds, ground pools, among others. In China, it breeds in a wide variety of water collections mainly in paddy fields . Interestingly, there is no paddy field in Yongcheng city. Therefore, ascertaining the precise breeding sites and related water quality index is of significance to the control of An. sinensis larvae and the ongoing malaria elimination campaign. Based on the present study, river fringes (13.3%), ponds (43.3%) and puddles (38.3%) were the primary breeding sites of An. sinensis larvae. For effective larval control, water bodies such as river fringe, pond and puddle should be given higher priority over others in An. sinensis abatement programmes in malaria epidemic areas with An. sinensis as the primary vector. This was in conformity with the results presented by similar studies conducted in the areas along the Huang and Huai River in China, with larval breeding sites in small water-bodies, such as ponds, paddy fields or gullies [28, 29]. In the current study, 90% of An. sinensis larvae were found in permanent breeding sites, such as river fringes, ponds and puddles, while only 10% of An. sinensis larvae were found in temporary breeding sites, including roadside ditches, rain pools, shallow drainages, and ground pools. This was coherent with the known preference of most anopheline mosquitoes to breed in natural permanent waters, while only few species were abundant in temporary breeding sites . This could be explained as due to most of the temporary breeding sites being relatively shallow and turbid . Therefore, An. sinensis larvae did not adapt to these circumstances. However, it has been reported that large or small temporary ground pools, particularly in the rainy season, could also provide ideal breeding sites for An. sinensis . In this study, 73.3% of An. sinensis larvae were found in water depths between 0.5 m and 1.0 m, and small amounts of An. sinensis larvae (5.0%) were inhabited in water depths less than 0.5 m. Thus, water depth between 0.5 m and 1.0 m might be the ideal breeding depth for An. sinensis larvae in Yongcheng city. In the village surroundings, we found the depth of most of the river fringes, ponds, puddles and irrigation drainages and ditches were between 0.5 m and 1.0 m. Therefore, it is also the types of breeding site which should be considered in An. sinensis larvae abatement programs in the future. According to the results of the present study, ammonia nitrogen, COD, and sulphate were negatively correlated to the presence of An. sinensis larvae. Ammonia nitrogen is the nutrient of water bodies; however, excess ammonia nitrogen discharged into water bodies could contribute to eutrophication and oxygen depletion in the water, and thus have toxic effects to fish and some aquatic organisms. In the present study, a high level of ammonia nitrogen was observed in the water bodies in the sampled villages, which is likely to lead to oxygen depletion in water bodies, leading eventually to suppressed density of An. sinensis larvae. Sulphate is a naturally occurring substance that contains sulphur and oxygen. Sulphate may be leached from the soil and is commonly found in most water supplies. There are several additional sources of sulphate in water. Decaying plant and animal matter may release sulphate into water. The treatment of water with aluminum sulphate (alum) or copper sulphate also introduces sulphate into a water supply. However, excess sulphate has some adverse effects on the water body, fish and some aquatic organisms [66, 67]. In the current study, the sulphate level in 30.5% of aquatic sites in the village surroundings was higher than 250 mg/L, and the increased sulphate in water may be explained as the increasing possibility of pollution by domestic sewage, industrial waste water and farmland runoff pollution in Yongcheng City. In environmental chemistry, the COD test is ordinarily used to indirectly measure the amount of organic compounds in water. Most applications of COD determine the amount of organic pollutants found in varieties of surface water or waste water, making COD a useful measure of water quality. In the current study, the COD level in 10.8% aquatic sites in the village surroundings was higher than 3 mg/L, and the increased COD in water may be explained as an increase of organic pollution, and thus may suppress the presence and abundance of An. sinensis larvae. Though other factors, such as the stability of mosquito larval breeding site, predator, pH, chloride, and chromaticity were excluded after being entered into a logistic regression model, their roles could not be ignored. Tadpoles, water bugs, dragonflies and chironomus larvae are suspected to be potential larval predators . When they were found in breeding sites, mosquito larvae were generally absent . Predators may play an important role in regulating populations of An. gambiae s.l. in rice paddies, while in permanent larval breeding sites such as ponds, predators such as fishes were observed, and they could suppress the abundance of mosquito larvae [69, 70]. In the present study, most of An. sinensis larvae were found in water bodies without predators, and this phenomenon could be explained as the suppression effect of predators on An. sinensis larvae in the breeding sites. Based on the findings mentioned above, it is probable that the breeding habit of An. sinensis might be changed to some extent. It has previously been demonstrated that mosquito larvae favored a pH-neutral environment [71, 72]. However, in the present study, 80.2% of An. sinensis larvae lived in water bodies with pH between 8.0 and 10.0 in Yongcheng city, and this was inconsistent with similar studies in China. This phenomenon could be explained as the adaptability of An. sinensis larvae to altered environmental conditions, especially water pollution. As to the breeding sites of An. sinensis, three containers in the household courtyards discovered the presence of An. sinensis larvae. This was the first time that An. sinensis larvae were found in containers in the household courtyards in the villages of Yongcheng city. The changes in breeding habit of anopheline mosquitoes were also reported in similar studies. A study in Dar es Salaam, Tanzania, showed a change of Anopheles sp. breeding requirements in urban settings during an extended dry period [71, 73]. Research in malaria endemic areas in Kuala Lipis, Pahang, Malaysia, demonstrated that changes in breeding characteristics were observed. Instead of breeding in slow flowing streams, most larvae bred in small water pockets along the river margin . Care needs to be taken in interpreting the results of this study. First, this study was conducted during a relatively dry year  and the rainfall was relatively low, therefore, it was unclear whether the breeding site structure found during the five months was representative of the structure found in years with normal rainfall. The related parameters of water bodies in normal years might be different from those in the dry years. Second, we did not survey the relatively small breeding sites, such as footprint, wheel mark, and tree hole, because these types of breeding site were uncommon in the field in 2010. For all that, this may lead to the omission of factors potentially important for mosquito control interventions. Third, the present study was done under natural conditions and external factors could play an important role in the colonization and growth of mosquito larvae in these breeding sites. Factors such as total suspended solids (TSS), total dissolved solids (TDS), dissolved oxygen (DO), orthophosphates, biochemical oxygen demand (BOD), heavy metallic elements and their compounds (Mercury, Cadmium, Lead, Arsenic, Chromium, Copper, Zinc, Manganese ), radioactive substances, mineral and their compounds contents (Calcium, Potassium, Sodium, Carbonate, Bicarbonate, Ammonium, Nitrate, Phosphate, Magnesium, Sulfate ions), and some microbial contents, were not controlled, which could play a role in the results obtained. Fourth, the urban area was not sampled during the study period, and this may weaken the representativeness of this study to some extent. Based on the findings mentioned above, breeding site type, water depth, COD, ammonia nitrogen, and sulphate were found to be the key factors determining the presence of An. sinensis larvae in the villages of Yongcheng city. For effective larval control, breeding site type, water depth, COD, ammonia nitrogen, and sulphate should be given higher priority in mosquito abatement programs in malaria endemic areas where An. sinensis is the primary vector. These findings could be very useful in understanding the ecology of An. sinensis larvae, in planning and implementing of An. sinensis larval abatement programs, and in providing strong guarantee for the elimination of malaria in China. Xiao-Bo Liu, Qi-Yong Liu, Yu-Hong Guo, Dong-Sheng Ren contributed equally to this work. This work is financially supported by the National Basic Research Program of China (973 Program) (No.2012CB955500, No.2012CB955504) and the Major National Science and Technology Projects of China (No.2008ZX10004-010). The funder had no role in study design, data collection and analysis, decision to publish, or preparation of the manuscript, and the content is solely the responsibility of the authors and does not necessarily represent the official views of the Major National Science and Technology Projects of China and the National Basic Research Program of China (973 Program). We sincerely thank Robert J. Novak, Ph.D. from University of South Florida and Weidong Gu, Ph.D. from CDC, USA, for their guidance in the field in Yongcheng city. We thank Yang Shen, Yunjun Su, Mingjie Zhu, Guangxu Zhou, and Haishan Wang from Yongcheng CDC for their participation in the field investigation in Yongcheng city. In addition, this project could not have been completed without the help of Kehua Peng, Qinglin Zhu, and Hengchao Xie from local township hospitals and village doctors in the research villages. The study was conceived by XBL and QYL. XBL, QYL, YHG, and DSR supervised field data collection, analyzed the data and drafted the manuscript. YC assisted with data analysis and together with JLL in writing of manuscript. JYJ, GCZ, HSL, CJZ, HZL and QL assisted with study design and logistical issues. All authors read and approved the final version of manuscript.